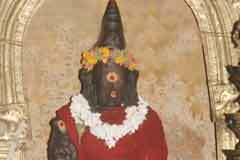 The temple is praised in the hymns of Saints Tirugnana Sambandar and Arunagiriar. This is the 5th temple in the Pandya region praised in Thevaram hymns. Chithirai Brahmmotsavam in April-May; Vaikasi Visakam in May-June; Tirukarthikai in November-December and Maha Shivrathri in February-March are the festivals celebrated in the temple. The rays of Sun fall on the Lord continuously from the months of Aipasi to Panguni covering the English months October to April and this is a rare feature of the temple. Lord Shiva is a Swayambumurthi. This is a three tier temple said to represent Padala Loka, Earth and mountains. Sri Kodungundra Nathar Temple, Piranmalai-630 502. Sivaganga district. The sacred tree Urangapuli (tamarind tree) has strange characteristics. It blossoms. Yields the tamarind but it will not ripe. It falls unripe. The leaves do not fold. There is another tree in the Mangai Bagar shrine on a rock bearing no name. No flower blossoms in the tree. Couples with difference of opinions pray here for a consensus. 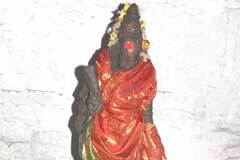 Those facing adverse aspects of planet Shukra (Venus) pray to Mother Ambica for relief. Devotees offer white Vastras to Ambica with special pujas. A contest arose between Vayu the Lord of winds and the divine serpent Adisesha about their prowess. The race was that Vayu should break the Meru Mountain bound by Adisesha. Despite his best efforts Vayu could not succeed in moving the mount but some pieces fell on earth. One such piece fell here. It is on this hill, this temple is built in three tiers consisting of Padala Loka, earth and the hill. Lord Shiva graces from this temple. Lord Shiva blesses the devotees in the name of Kodungundra Nathar from the Padala Loka temple, in the middle as Viswanatha with Mother Visalakshi and at the top as Mangai Pagar. 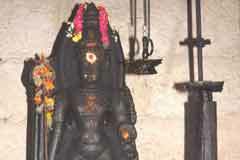 The upper temple is of a cave type-Kudavarai Koil. Lord appears in His wedding form with Ambica as He granted darshan to sage Agsthya. This is called ‘Love Form-Anyonya Kolam’. The sculptures depicting the countless Devas gathered at Mount Kailash to attend the divine wedding are on the upper wall of the Mandap in the front of the temple. 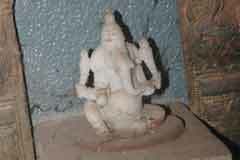 The idol of Mangai Pagar is made of the essence of nine herbals. Cosmetic substances including an oil are applied on the Lord. 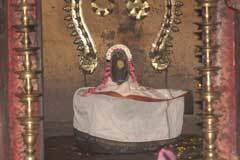 There is also a small Linga in this shrine, ‘Udayavar Lingam’ gifted by King Kasirajan. All abisheks are performed on this Linga only. As the region belongs to the Kurinji category of land with hills, the produces of the land as Thinai flour, honey and raw rice are used for making Dosas (a popular dish of Tamilnadu) for nivedhana. There is no Nandhi in this shrine. 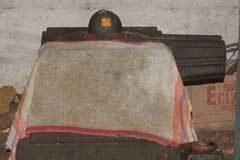 When Lord granted His wedding darshan to sage Agasthya, Nandi was playing the Maddalam the leather instrument. Hence, he could not be present on the occasion. The absence of Nandi is attributed to this event. Also there is no flag post and Bali Peeta in this shrine. During the consecration of temple, a gum made of eight herbals-Ashta Bandanam is used to re-install the deities. Such a procedure is not followed in this temple as Lord Shiva is Supreme without a beginning or an end. Lord Shiva appears here in “Love’ mood. A vastra once used is not used again. It is new every day. During the pujas Lord is dressed with a long dhoti of 8 yards and an upper cloth, so Mother Ambica too with a 9 yards sari. Lord Shiva is also praised as Veda Shivan as He is holding the four Vedas in His hands. It is noteworthy that during the last three months of Dakshinayana half year and during the first three months of the Uthirayanam half year comprising of English months of October-November to March-April, the rays of Sun fall on the Lord continuously. This is a rare feature in this temple only. It is said that Lord Muruga granted His dancing darshan. But He appears old in the temple. Against the traditional Peacock vahan in the shrine, Elephant occupies the position. There is a window wall with 18 holes opposite Muruga shrine. The elephant can be seen only through these holes. Theerthavari is celebrated in the nearby river Palaru. Lord Muruga installed two Shivalingas for worship and got relieved from the dosha of killing demon Surapanma. 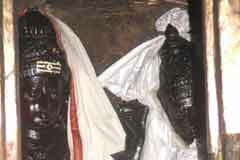 These two Lingas are in the Kodungundranathar Shrine prakara called Chockalingam and Ramalingam. Lord Muruga is in between the two Lingas as if His father is protecting Him from both sides. Devotees carry milk pots to Lord Bhairava during the Chithirai festival in April-May as is generally followed in Lord Muruga worship, because it is said that Lord Bhairava too came from Lord Shiva. Those suffering from amnesia, shy and fearful in nature pray to Lord Bhairava offering Samba rice and Vadamala-a garland made of Vadas (a popular Tamil dish). 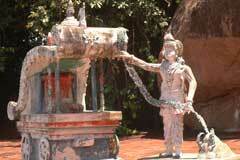 Lord Bhairava has His own Theertha-sacred spring too. Those suffering from skin problems, bathe in this theertha and pray to Lord Shiva for cure. 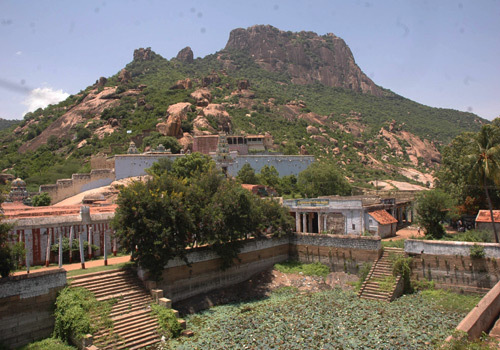 After praying Lord Shiva in Vedaranyam, Saint Tirugnana Sambandar came to this place to worship Lord, who appeared before the saint in the form of a hill. In his Pathigam (10 verses), Sambandar called this place, “Embiran Malai” which later changed as Piran Malai. We know the popular story that North went down due to the heavy weight caused by the huge crowd of Sages and Devas gathered there to attend the Shiva-Parvathi wedding. Lord Shiva sent powerful dwarf sage Agasthya to go south to equalize the ground level. Agasthya came to Pothigai hills in south. But Agasthya had to sacrifice the pleasure of joining the divine wedding party. Agasthya begged Lord that he should be able to get His darshan at all places of his choice during his pilgrimage. The boon granted, the sage enjoyed the Wedding function in many places including this place-Piranmalai. 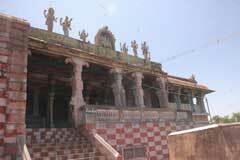 The temple is under the administration of Kundrakudi Devasthanam. Miracle Based: Lord Shiva is a Swayambumurthy in the temple. It is noteworthy that the rays of Sun fall on the Lord both during the last three months of the Dakshinayana and first three months of Uthirayana half years covering the English months October-November to March-April. Piranmalai is 65 km from Madurai on the Ponnamaravathi road. The temple is near the bus stop. Buses are available from Madurai.